VISITORS to the Big 5 at the World Trade Centre in Dubai got an understanding of Australian firm Euclideon International’s Hologram Room, one of the attractions of the Innovation Trail, this year’s new feature at the construction exhibition. The Hologram Room immerses users in an incredibly life-like 3D copy of the real world obtained by an ordinary laser scanner; the scenes provide unlimited detail and complexity. Visitors also got acquainted with the MEA Rin drainage channel from MEA Water Management of Germany, described as the only pre-fab drain channel made from innovative GRP material and which is fully conformable with the EN norm. Then there was the MLP-RO system from Condair, Germany, a high pressure nozzle system that can be used for various evaporative cooling and humidification applications. These were among several innovative products on The Innovation Trail that ran through the show with stops at pre-selected stands. The fair, traditionally a big draw for the construction industry, wound up after four hectic days, setting a record for its editions with more than 2,700 exhibitors from 60 countries participating in 2014. Big 5 Group event director Andy White said the 2014 edition, the 35th so far, came at an opportune time. “With massive building and infrastructure spending driving the GCC’s construction boom, leading international and regional decision-makers and construction industry leaders converged on Dubai World Trade Centre for the shows,” he stated. The total value of construction contracts awarded this year in the region will soar to $196 billion, up from $160 billion in 2013, said White, citing a report by Ventures Middle East. Held along with the Big 5 were Middle East Concrete and PMV Live, co-located to offer a more comprehensive sweep of the construction industry. The three offered 55 CPD-certified and free-to-attend workshops as well as 48 technical seminars. A two-day conference on Sustainable Design and Construction presented eight Middle East projects showcased directly from the appointed project architects, developers and contractors themselves. 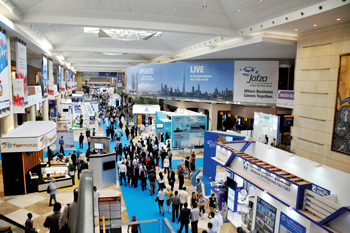 Saudi Arabia, one of the prominent players in GCC construction, came to the show with a lineup of 100 companies. Saudi Exports Secretary-General, Ahmed bin Abdul Aziz Alhaqbani, said the Saudi participation was part of the preliminary phase of Saudi Exports and the exhibitors were competing to increase their footprint in the global construction markets. “We work in synergy with manufacturers and government departments to attain the broader goal of boosting the economy,” he added. 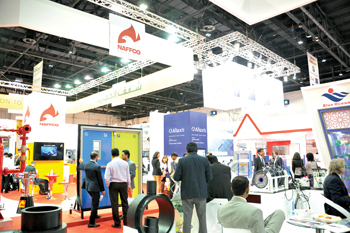 Another Gulf powerhouse, host UAE, featured a number of local manufacturers playing a key role in feeding the requirements of the local construction boom. Conares, the Gulf’s second largest private steel plant, showcased its products including rebars, ERW (electric resistance welded) and galvanised pipes. The company, a key player in steel manufacturing and trading of steel pipes and steel rebar for both global and regional suppliers, has a 15 per cent share of the UAE market in its specific product segments. It currently supplies about 350,000 tonnes of rebar, about 10 per cent of the UAE’s total domestic requirement. The company also supplies about 100,000 tonnes of pipes, around 25 per cent of total market demand in the region. Bharat Bhatia, chief executive officer of Conares, said local manufacturers should increase production to reduce imports. According to him, 60 to 70 per cent of UAE demand for steel rebar is being addressed by local firms with the rest covered by imports. Demand in the UAE rebar market is stable at about 3 to 3.3 million tonnes for the current year. Demand for steel products in the UAE has increased by 15 per cent in 2014, compared to last year, he said. Bhatia also said that the Dubai steel market has enough capacity to support the new wave of infrastructure developments planned up to 2020. “The technologies and capacity to cater to this requirement immediately are in place and operating,” he remarked. Al Tayer Motors used the Dubai trade show as a platform to introduce a brand new range of heavy commercial vehicles to the UAE. Ford Trucks and Al Tayer unveiled three new models at the Big 5: the 1843 T tractor head, the 3535 D 6x4 tipper, and the 4135 M mixer. Nine exhibitors from Wales took part at the Big 5 as part of the official Welsh Trade Delegation. One of them was Dragons Breath Solar, which presented unique self-cleaning solar panels, especially suited to the Gulf’s climate. Wales’s Economy Minister Edwina Hart said: “This trade mission provides opportunities for companies operating across a number of our key sectors while the Big 5 event attracts trade buyers not only from the Middle East but from across the world.” An aluminium framework company formed in Malaysia in 1991, MFE Formwork Technology, presented at Middle East Concrete a range of its latest formwork construction systems and technology. It has participated in prominent projects in the Gulf including the Dubai Marina and Al Fattan Towers. The company’s technology helps to cast walls, floor slabs, columns, beams, stairs, balconies and door/window openings. Lüdenscheid, Germany-based exhibitor Küberit, the manufacturer of trims and flooring profiles, promises a perfect finish for almost every floor in every situation. Küberit designed PPS-Champion Star, the narrowest available profile systems in the world for the installation of LVT floorings and carpets. Due to the combination of torx screws and reinforced drilling holes in this Küberit profile, a safe fitting of the screws is granted and an inclination of the screw is avoided. Forty French firms were at the Big 5, among them Atlantic Renewable Energy Solutions and Presto. Atlantic chose the Big 5 for the commercial launch of its new mixed renewable energies water heater as part of its wide portfolio of global solutions for both domestic and commercial applications. Presto, a family-owned company, has been designing, manufacturing and marketing taps and fittings for all types of public sanitary facilities for three generations. It highlighted its Presto 1000XL DVA, a dual volume direct flush valve which allows water savings of up to 90 per cent compared to a conventional flush, thanks to its two separately adjustable water volumes. The second product highlighted was the Alpa timed flow shower mixer tap with waterproof concealed box. Sedes Group, headquartered in Oderzo, near Venice, Italy, highlighted its heating elements. The company exports more than 70 per cent of its output thanks to a subsidiary in Brazil and several distributors in Europe. The company participated at the Big5 for the second time, seeking to expand exports in the Middle East and looking for highly motivated importers and distributors who can introduce in their markets its products and develop a local network. Also at the Big 5 was the Czech company Alcaplast, the largest manufacturer of sanitaryware in Central and Eastern Europe.